When I was lying in a hospital bed recently, all pretzel-shaped because the bed was somewhat lacking in the mattress department, Fluffy looked for anything he could to distract me from my pretzel status. One of the things we discussed was the sad death of poor Cecil the Lion, over in Zimbabwe. 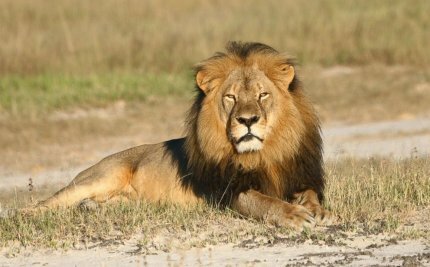 Cecil's sad fate is old news to most of you, but in case you were hiding under a rock or on vacation or have quit reading newspapers (as I have) because you are fed up with the state of the world's affairs, I will tell you the condensed version. Cecil the Lion, in happier days. Photo by the Wildlife Conservation Research Unit. A hapless Minnesota dentist, whose hobby is shooting exotic animals with the intent of killing them dead, went over to Zimbabwe with the intent of bagging a lion. He spent a whole lot of money -- $55,000 according to the news story Fluffy read -- to buy the permits that would allow him to do this legally and lawfully. Unfortunately, the guides he hired were not as excited as he was with the prospect of doing it legally and lawfully. They lured a lion out of a protected game preserve, where the dentist shot him with a bow and arrow. When the lion didn't die after more than 40 hours of being tracked, it was eventually dispatched with a gun and decapitated so the dentist could take home his expensive new trophy. It was only after the animal was dead that the dentist realized something was wrong. For one thing, the lion was wearing a GPS tracking collar, meaning that perhaps it wasn't as wild as he had hoped. Oops. But things would only get worse from there. It turned out that the lion wasn't just any old GPS tracking collar lion. Oh no. This lion was Cecil, Zimbabwe's all-time favorite mascot lion. And when the people of Zimbabwe found out he had been killed by an American hunter, they were steamed. Before I go any farther in the story, I need to tell you where we in the Kidd household stand as far as the hunting of animals is concerned. First of all, I am an unabashed carnivore. If it is a meat product, bring it on. Bones and fat and sinews are fair game. No, that is an understatement. Bones and fat and sinews are the stars of the show. I can chew on your standard pork chop bone for over an hour, removing every atom of non-bone material. My mother once asked the doctors she worked for if there was something wrong with me because I ate so much of the animal, up to and including the gristle and the marrow. The doctor said if I was eating that, it was because my body needed it. Sure enough, I have been anemic for most of my life. I crave liver and spinach, too. So yes, if you hunt the animal with the intent of eating it, go ahead and hunt. We have friends who bag twenty deer (and more) per year, and they eat every scrap of the meat. More power to them. But if you're hunting big game animals such as lions or giraffe or wildebeest, we would prefer you use a camera. There's a compelling reason for doing this, and that's that only one person can bag a lion with a bow and arrow, but tens of thousands can shoot the same lion with a camera. Why in the world would someone choose to destroy such a magnificent creature? Despite this bias against trophy hunting, it may surprise you to learn that we have come down firmly in the camp of the Minnesota dentist. Here is a guy who spent $55,000, thinking he had dotted all his i's, and crossed all his t's. He thought he had bagged a completely legal lion -- right up until the moment his guides cavalierly cut off the GPS collar from Cecil's neck and proceeded to destroy it. I'll bet the dentist had his own "Oops" moment then. As odious as the whole lion-shooting thing is to me, lion-shooting is legal, or at least it is legal where the dentist did it. I am assuming (and we all know that "assuming" is a big word) that the dentist could not see the GPS tracking necklace on the lion's neck when he shot the lion, and that his story that he shot the lion in good faith is the truth. If that is the case, why has he been harassed to the point that he has had to close his dental practice and go into hiding? Why is he getting death threats? Why is his summer home in Florida being vandalized (with bloody pickled pigs' feet, no less)? Why are the do-gooders who write YELP reviews writing phony reviews that give the dentist's practice one star, not because of his dental work but because he is a hunter? I have always thought YELP reviews were worthless for exactly this reason, and this only confirms it. Millennials get in a snit and ruin someone's reputation over something that has nothing to do with the business at hand. And I wondered how many of these enlightened YELP users were proudly pro-choice, and therefore supported a practice that is light years more barbaric than trophy hunting. But I digress. What I find more than a little pathetic is one little bitty news story that appeared last week about an Idaho woman who just killed a giraffe in South Africa. I had to look really hard to find this article the second time. I knew it was there, but it took nearly fifteen minutes before I finally tracked it down. And I consider myself to be almost expert on the internet. You can be sure this hunter is not going to get back to Idaho to find pigs' feet in her driveway, or death threats, or other horrible things going on in her Idaho community. Do you know why? I will tell you. This hunter has the ultimate free pass. She is a woman. And right now, women can do just about anything and get away with it. The lion killer's sin was not that he killed a lion. It was that he was a white man who killed a lion. If he had been a woman who killed a lion, he would have gotten a slap on the wrist, and the people who would have been blamed were the people who should have been blamed all along -- the guides who baited the lion out of the protected game preserve for the hunter to shoot. But because he was a privileged white man, nobody is blaming the people in Africa who set up the kill. Everyone is blaming the hunter who paid $55,000 to kill "a" lion and instead killed "Cecil the beloved mascot lion." And I am not at all sure that is where the blame belongs. I am sorry that Cecil, the beloved mascot lion, is dead. But you know what? I am equally sad about the giraffe. And I think that the Minnesota dentist is an idiot. But you know what? I think the Idaho woman hunter is an equal idiot. If one deserves to be pelted with bloody pickled pigs' feet, so does the other. I am fed up with a country that treats men like pariahs just because they are men, and treats women better than men just because they are women. Didn't women campaign for equal rights? Then why are they demanding to be treated better than equal, and why do they not speak out for men who are attacked for just being men? I don't like any of it, but I'm just a grumpy old person. I like women and men, just as I like lions and giraffes.